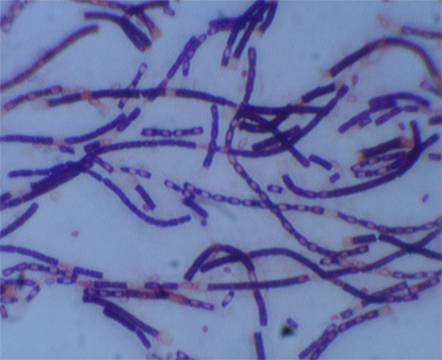 Anthrax bacteria is a rod-shaped culture. Most common forms of transmission are through abrasions in the skin and inhalation. Imagine researchers in hazmat suits moving slowly and deliberately through a lab. One of them holds up a beaker. It’s glowing. This light — or the absence of it — could save millions of dollars for governments and save the lives of anthrax victims. Scientists at the University of Missouri Laboratory of Infectious Disease Research proved a new method for anthrax detection can identify anthrax quicker than any existing approach. When the “bioluminescent reporter phage” — an engineered virus — infects anthrax bacteria, it takes on a sci-fi-movie-type glow. George Stewart, a medical bacteriologist at MU’s Bond Life Sciences Center, and graduate student Krista Spreng, observed the virus against a variety of virulent strains of bacillus anthracis, the bacteria causing anthrax disease. “For this technique, within a few hours, you’ll have a yes or no answer,” Stewart said. The research, funded by the USDA, was published in the Journal of Microbiological Methods in Aug. 2013. David Schofield at Guild BioSciences, a biotech company in Charleston, S.C, created the reporter phage. This new method could save a significant amount of money associated with the decontamination of anthrax from suspected infected areas. With the country on high-alert following Sept. 11, 2001, a slew of bioterrorists mailed anthrax letters, filled with a powder that if inhaled could cause death. Numerous Post Offices and processing facilities were closed and quarantined. The clean-up bill for the 2001 Anthrax Letter attacks was $3.2 million, according to a 2012 report in Biosecurity and Bioterrorism: Biodefense Strategy, Practice and Science. Theoretically, the new detection method would alert of a negative result potentially five hours into clean-up efforts instead of two or three days into expensive decontaminating. Current methods take anywhere from 24 hours or longer to produce a definitive answer for anthrax contamination. Stewart said from contamination levels expected from a bioterrorism threat, a positive answer could be found in five hours. If contamination levels were higher, results would come back much more quickly. Prior to this bioluminescent reporting phage, experts used techniques that were culture based or PCR (polymerase chain reaction) based. Both methods, require additional time for a definitive answer, a minimum of 24 to 48 hours, Stewart said. From a bio-threat standpoint, breathing in anthrax, is the highest concern for public health and homeland security officials and has the highest fatality rate among forms of anthrax. “If you have a situation and need a quick yes or no answer, this is a tool that will help that,” Stewart said. Terrorists have used a powder form of anthrax, which has been slipped into letters of political persons and media. A person is infected when an anthrax spore gets into the blood system, most commonly through inhalation or an abrasion on the body, according to Centers of Disease Control and Prevention. For low levels of contamination, the bioluminescent reporter phage would still detect the presence of the bacteria, but it would take longer. “This method will be as quick as any of the others and quicker than most,” Stewart said. The bioluminescent-detection method can detect low levels of anthrax bacteria and rule out false positives. The added benefit to this reporting system is its ability to show that anthrax bacteria are present and it’s alive, Stewart said. The next step in the bioluminescent reporter phage is getting it approved so a product can be produced and branded. The agency that would warrant the stamp of approval would depend on the eventual use of the phage — food-related testing would likely go through the Food and Drug Administration, Stewart said. When that happens, a product would not necessarily require a formal lab — it would need a place where cultures could grow at 37 degrees. “Samples could be collected, brought back to the state public health lab for example and then the testing could be done within a few hours of the collection of the samples and you would have a result,” Stewart said. The last anthrax attack was in 2001, but the possibility of one happening again, Stewart said, remains a driver for proactive research. Stewart’s research on anthrax bacteria and detection methods recently appeared in the August 2013 edition of The Journal of Microbiological Methods. Despite their very basic higher functions, Bond LSC researcher Anand Chandrasekhar wants to understand how their brains work. More importantly, he wants to know how individual neurons end up ordered, all in the right place to support the animal’s automatic functions like breathing, swallowing and jaw movement. This could one day lead to better understanding of specific neuronal disorders in humans. 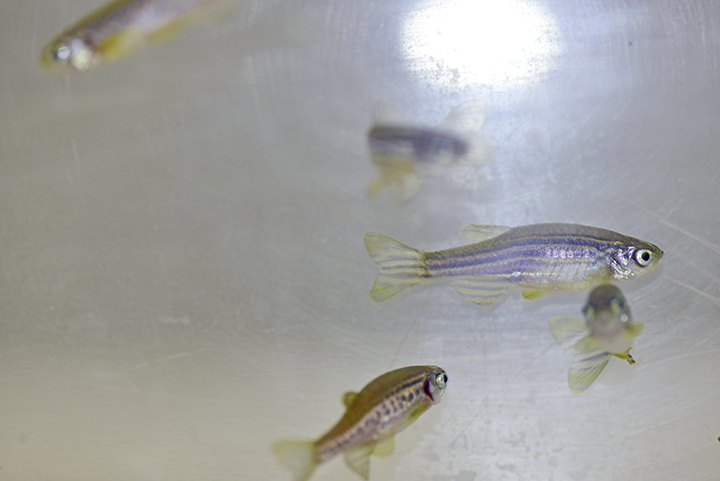 Zebrafish are a perfect model to study for many scientists. Given plentiful food, adult zebrafish lay thousands of eggs that fall through a screen in the bottom of fish tanks to be collected. These eggs turn into new embryos that are nearly transparent, allowing for easy observation of the 3-4 mm fish under a microscope. Scientists have not only sequenced the zebrafish genome, but they’ve also inserted fluorescent jellyfish protein genes into the genome. This allows easy tracking of neurons. These motor neurons are concentrated in the hindbrain. Akin to the brain stem, it controls the gills, breathing and jaw movement in these tiny fish. Genes controlling these functions are similar in zebrafish, higher vertebrates and humans despite their evolutionary paths diverging millions of years ago. 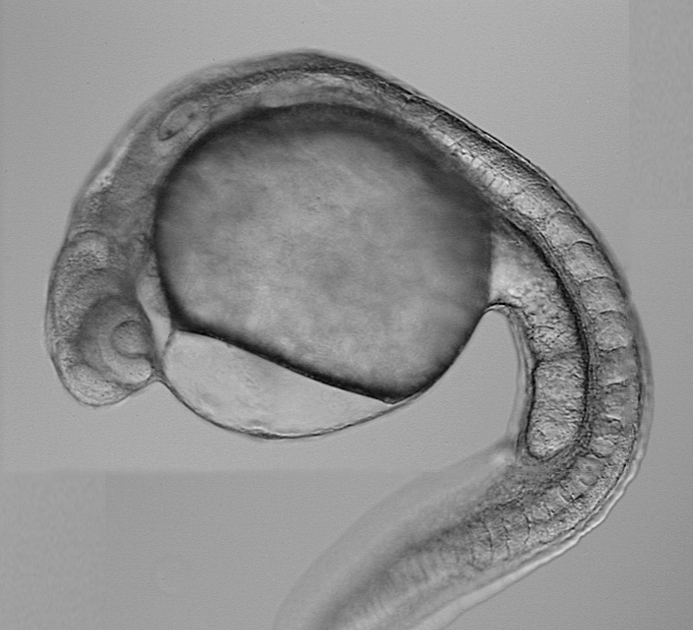 Zebrafish embryos measure only 3-4 mm seven days after they hatch. Chandrasekhar observes their motor neurons in this stage to discern how they migrate as the embryo develops. Courtesy of Anand Chandrasekhar. This migration and signals that control it are what Chandrasekhar’s research is all about. 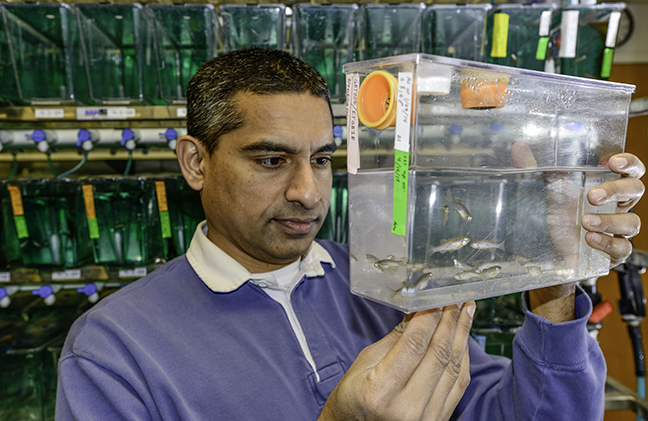 For example, his recent studies suggest that a protein called Vangl2 plays an important role in regulating movement of neurons through the zebrafish embryo’s matrix of tissue. Proteins like this are present in many organisms, from flies to fish to mammals. Chandrasekhar’s work contributes to a better understanding of how basic neuronal networks are created in development. That sort of knowledge could one day help with understanding the mechanistic bases of diseases like spina bifida, a nervous system disorder that results in muscle control problems due to the spinal cord not completely closing. Versions of this defect affect 1 in every 2,000 births, according to the National Institutes of Health. Chandrasekhar’s work on Vangl2 recently published in the Feb. 2014 edition of Mechanisms of Development and the Oct. 2013 edition of Developmental Biology. Chandrasekhar is a professor of biological sciences in the Division of Biological Sciences and Bond LSC researcher. Read more about his work at www.chandrasekharlab.net.